LawPRO has made civil litigation its priority as it seeks to avoid a flood of new claims when the new automatic dismissal rules kick in at the beginning of 2017. The new rules relate to Rule 48 of the Ontario Rules of Civil Procedure and state that any lawsuit commenced before January 2012 that has not settled or been set down for trial by January 1, 2017 will be dismissed without any notice by the Court. 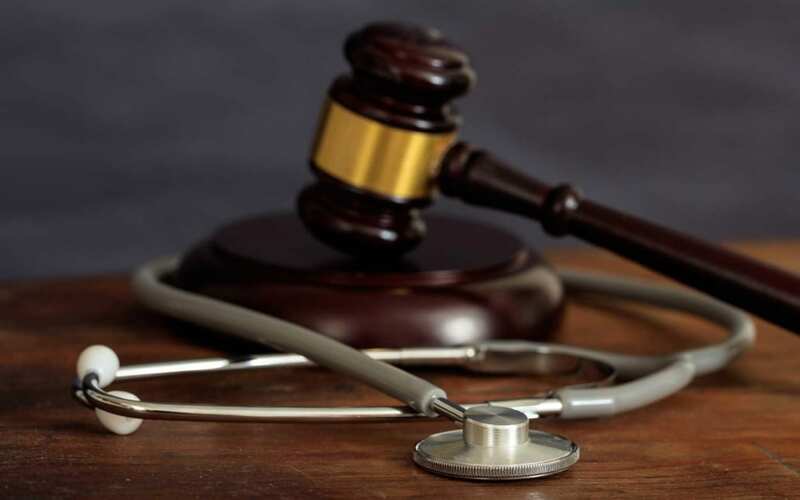 Prior to 2015, individuals only had 2 years to set their matters down for trial before a notice was sent out by the Court to dismiss the claim for abandonment. The new rule, however, replaced this warning with a longer deadline, making dismissal of a claim automatic after five years. 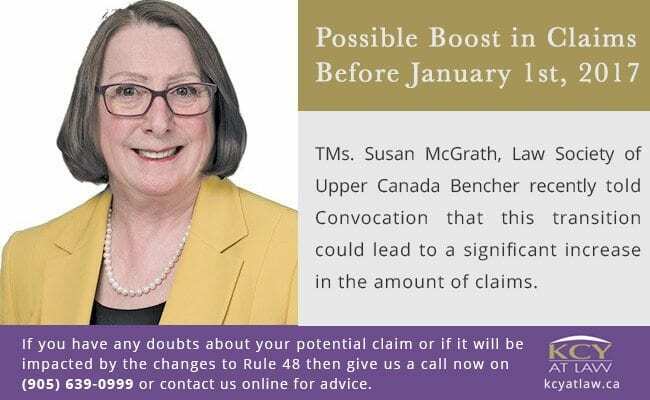 Ms. Susan McGrath, Law Society of Upper Canada Bencher recently told Convocation that this transition could lead to a significant increase in the amount of claims. Given the fast approaching January 1, 2017 deadline, expect to see many lawyers with cases not yet set down for trial but ones which were commenced before 2012 to be cramming in as many steps to get their matter as ready for trial as possible in order to avoid automatic dismissal. All lawyers need to familiarize themselves with the requirements under Rule 48, and specifically the transition provisions. Dates should be updated in any tickler systems used to reflect the new deadlines and to avoid any hiccups in the management of any given file. This is especially important as the Courts will no longer be sending out any notices of actions being dismissed. 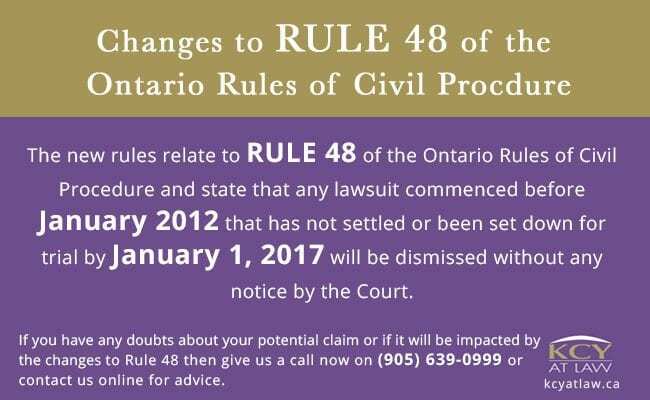 If you have any doubts about your potential claim or if it will be impacted by the changes to Rule 48 of the Ontario Rules of Civil Procedure then give KCY at LAW a call now on (905) 639-0999 or contact us online for advice.